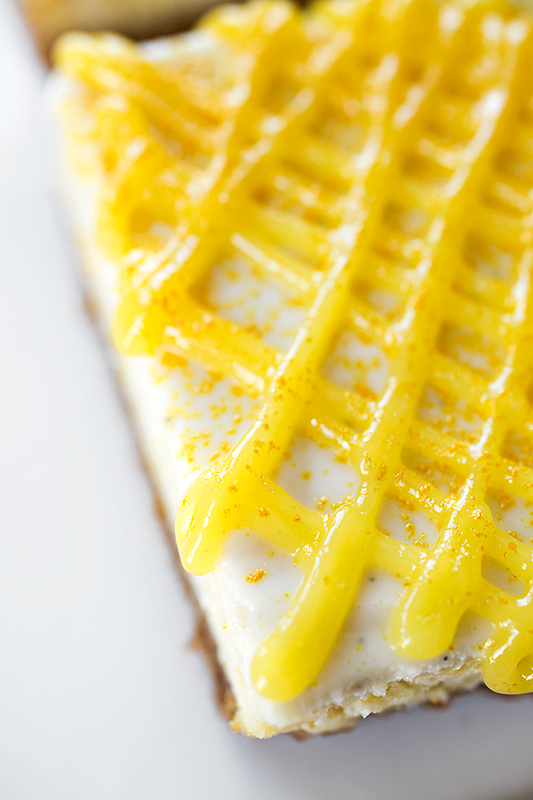 A lemony dessert just makes me want to smile. It also makes me want to pucker up and then perhaps even use that very pucker to smooch someone, and tell them that I love them. 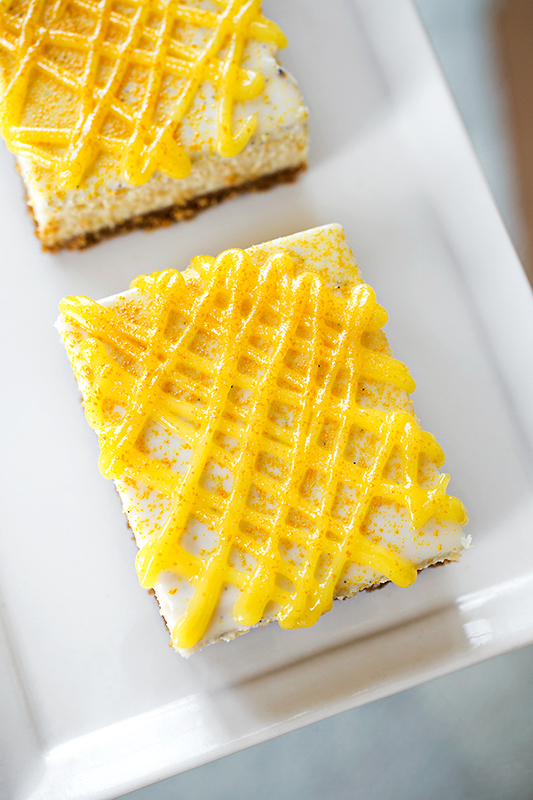 A sweet and tangy lemony treat brings out the kid in me; it brings out my innocent side, my whimsical self that wants to finger paint and draw silly faces and big, bold and brightly yellow-gold suns with long reaching, arm-like rays that mischievously tickle the people below. A lemony summertime dessert just puts a little extra light into life, along with a sweet richness that stays and plays on the tongue. And that’s exactly perfect right now! Sometimes I feel like a child trapped in an adults body—do you ever feel that way? Aren’t there days that you wish you could just spend experimenting in your kitchen, baking tasty bars for everyone to enjoy, and finishing those tangy and juicy bars with lemon curd swirls that shine, glisten and glimmer with sugary golden dust? It’s all good fun, and a wonderful little escape; and I’m wanting to share the experience with you. 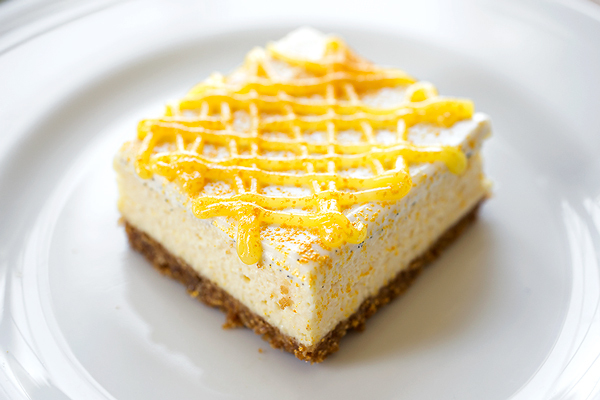 There’s no time like the summer for rich, cool and creamy Lemony “Sunshine” Cheesecake Bars; there’s no time like the summer for the flavor of a leisurely and more child-like state of mind, or for the glossiness of the golden light that cascades over all of us in the warm afternoon and fills us with a little extra hope and joy. 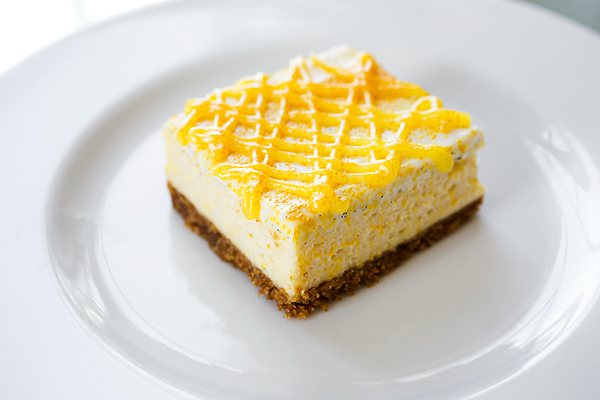 Today is a perfect day to prepare and share a wonderfully zingy and lemony dessert, and bring a little extra light and love into another’s life. That way, we can all enjoy being a touch more child-like today than we were yesterday, and that’s a de-light-fully good thing. -Preheat the oven to 350°, and line a 11 x 7 x 1 ½” baking dish (or even a 9 x 9”) with enough foil so that there is an overhang (makes for easier lifting/removing of the cooled bars), and mist lightly with cooking spray. 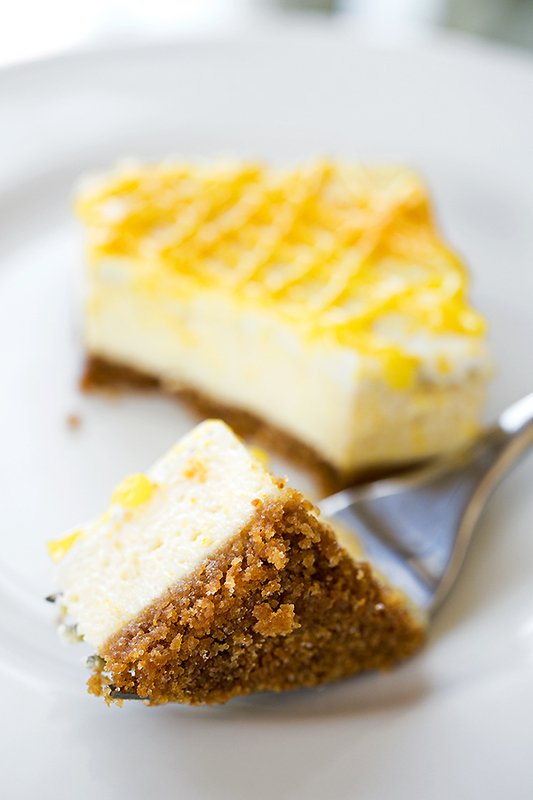 -To prepare your crust, add all of the crust ingredients to a bowl, and using your fingers or a fork, combine until all the crumbs are well coated in the melted butter; pour the crumb mixture into the prepared foil-lined baking dish, and press them using the back of a measuring cup to create an even layer of crust; set aside. 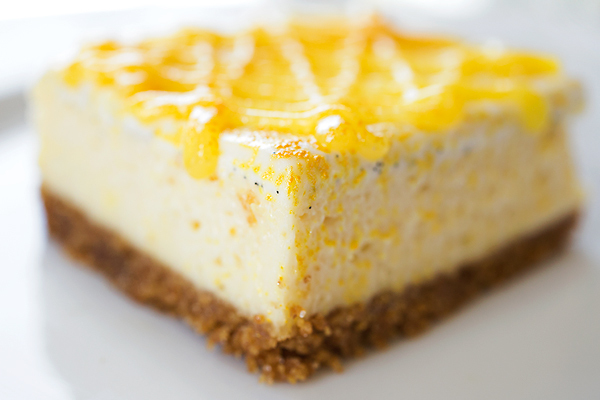 -To prepare your filling, add the softened cream cheese, along with the lemon zest and juice, into the bowl of a food processor, and process until smooth; add the sugar, the eggs and the vanilla, and process again until completely blended and smooth; pour the filling over the prepared crust, and smooth out the top. 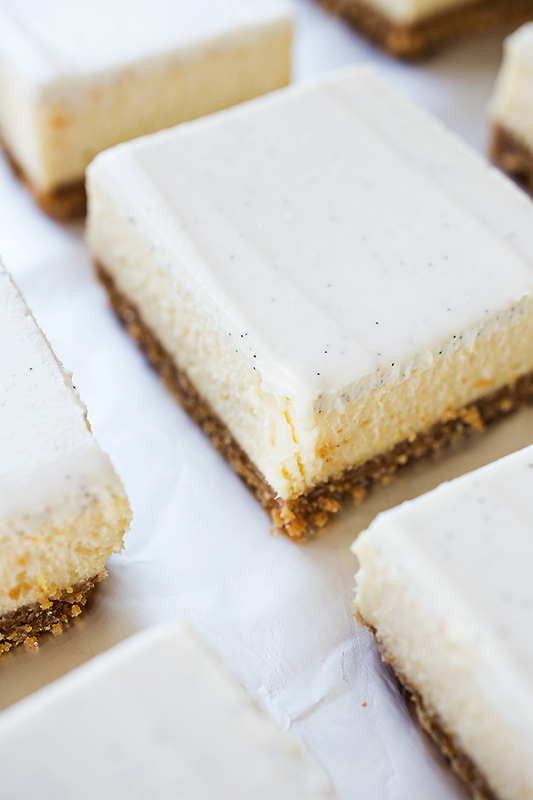 -Bake the cheesecake bar mixture for about 30-35 minutes, or just until the center of it still slightly jiggles; remove from oven and allow it to cool for 30 minutes. -Place into the fridge and allow to completely chill for at least 3 hours (or even overnight, ideally) to set. 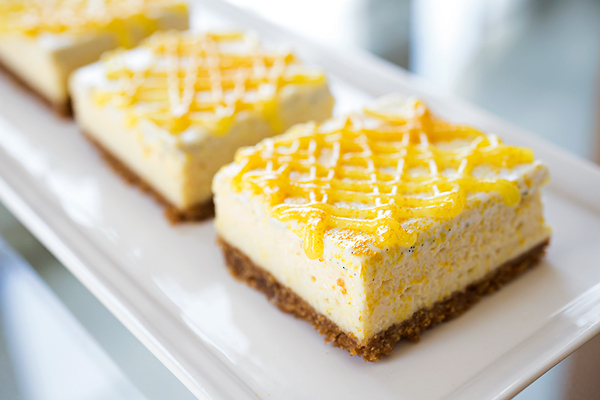 -To finish, drizzle/pipe some of the Lemon Curd over the top of the bars decoratively, and sprinkle with a little edible gold “dust”, if desired. -Add the sour cream to a bowl; next, split the vanilla bean pod down the center, and scrape the paste out of it; add it to the sour cream. -Add in the powdered sugar, and gently whisk the ingredients together just until blended; cover and refrigerate until ready to use. -In a medium-size bowl, combine the sugar with the lemon zest, and using your fingers, work the zest into the sugar. -Add the whole eggs, the yolks and the juice, and gently whisk to combine. -Set the bowl over a pot of simmering water (double boiler method), and using a spatula, carefully and continually stir the mixture for about 6-8 minutes, scraping the sides and the bottom of the bowl to prevent scrambling (it’s alright if you have a little scrambling), or until it becomes thickened and has a pudding-like consistency. 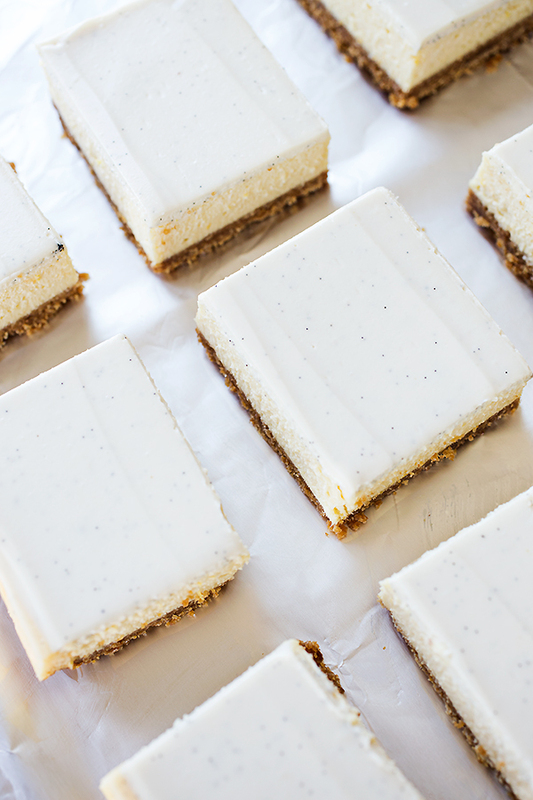 i love the sour cream and lemon topping and how you cut perfect squares! I’m a big fan of sour cream in desserts! 🙂 Thanks, Dina! What a beautiful summer-y dessert! 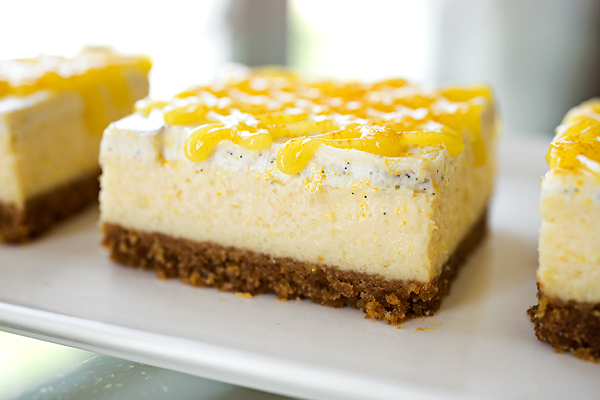 This sounds amazing, and I’m loving the idea of the balance between the tart lemon and the slight sweetness of the cheesecake! Thanks for sharing! Thanks so much, Erin—my pleasure!